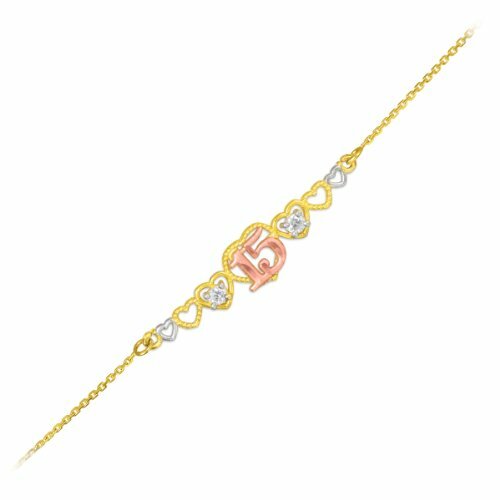 This stunning piece has "15" in center with heart cut-out designs on a bar style gold bracelet. 14 karat tri-tone gold bracelet with cubic zirconia accents for the perfect Quinceanera jewelry. Quinceanera bracelet that will sure to be as lovely as the debutante. If you have any questions about this product by Quinceanera Jewelry, contact us by completing and submitting the form below. If you are looking for a specif part number, please include it with your message. Solid 14K White Gold Filigree Eastern Orthodox Cross Crucifix Pendant Necklace, 18"
14k Yellow Gold Natural Green Jade Heart Script "Love" Pendant Chain Necklace,18"